We will then stay at the Cask til kicking out time, or someone suggests going to another pub to make it eight (I think we eventually made nine in the end last year!) Please come along, and if it is your first time remember this isn’t about drinking (completely) – rather savouring the interesting architecture of London’s pubs. Well, maybe a bit of drinking too. Facebook event here if you want to invite other people. There seem to be a lot of annual pub crawls around Xmas time – myself and my friends do a Finchley pub crawl on Xmas Eve every year (this one will be the 5th I believe), and I just got invited on another friend’s annual pub crawl around Chalk Farm and Camden over the Xmas period. Is the Christmas Pub Crawl a British tradition? 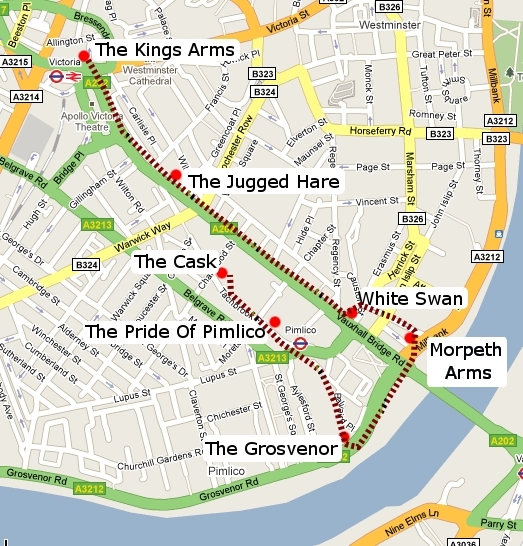 The tenth FT pub crawl! How long ago it seems that we were on Tottenham Court Road larffing at the pub which had put Kid A on the jukebox. Finishing in the Cask is a good idea given its lovely food. this is part of the FT periodic table for some reason! Oh no! The cask is shut, and so the final pub is the Queens Arms, Wilton way, SW1 something. Same time. Soz no link.